Last week Sprinkles offered a limited-time-only cupcake for the birth of the royal baby George. 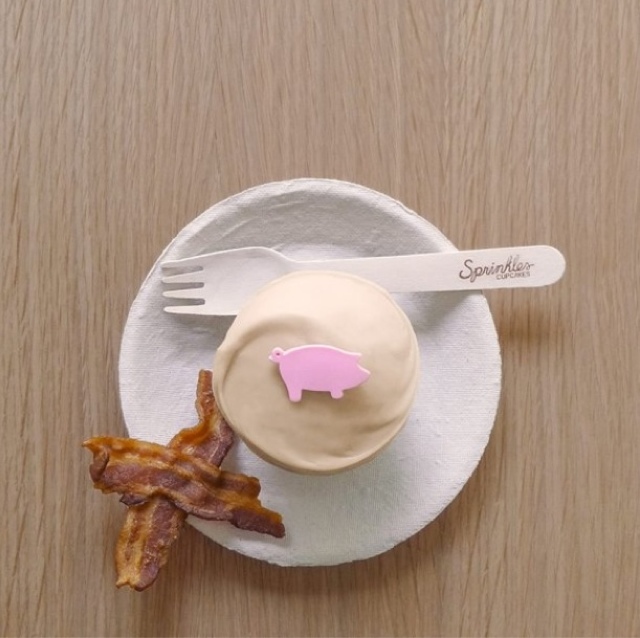 The next big news in the Sprinkles Cupcake world is their new flavor. Yes, a new flavor is exciting, but this cupcake exceeds that excitement because it is Sprinkles first savory cupcake!! I knew this day would come, and of course it has BACON! "Thick, smoky bacon is baked to a crisp and woven into our Madagascar Bourbon vanilla cake. Topped with rich, buttery maple cream cheese frosting." Yum! Of course I'm super thrilled to try this new cupcake, but I must say that Sprinkles is a bit tardy on the savory cupcake bandwagon. I tried my first bacon cupcake probably five years ago. 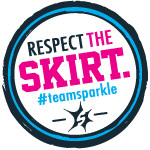 Although Sprinkles labels this as a new flavor, it will only be available September 6-22. Don't miss out! 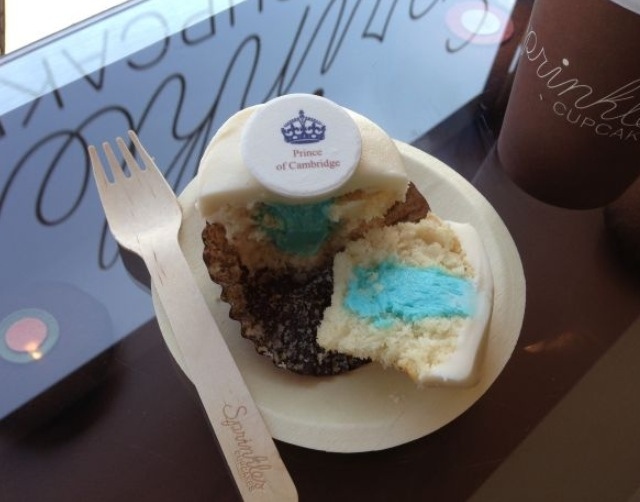 This time it's Georgetown Cupcake and they are offering these special cupcakes for the next two weeks, by pre-order only. 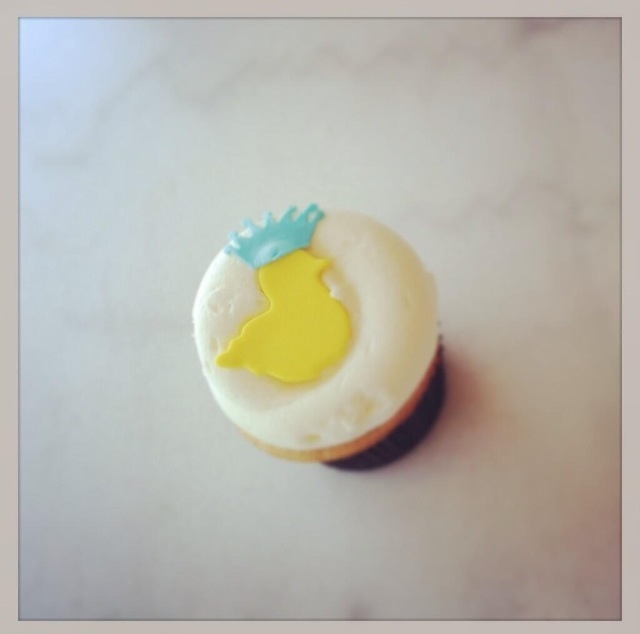 These baby George cupcakes are vanilla cupcakes stuffed with baby blue buttercream, frosted with vanilla buttercream, and topped with a fondant ducky and blue crown. Welcome to the world, George Alexander Louis! Last week led us down to San Diego for a wedding. So you know what that means.....a trip to Elizabethan Desserts. 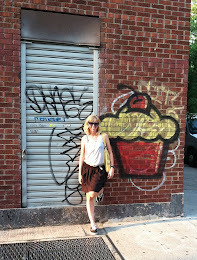 If you know me, you know that Elizabethan Desserts is my favorite cupcake shop of all time. Anytime I get the chance to visit, I don't pass it up. If you've been there, you know why. On this day I made good use of my visit and grabbed as many cupcakes and sugar cookies I could carry. I knew I wouldn't have a problem "getting rid" of them. Desmond had his first taste of the deliciousness of Elizabeth Desserts. 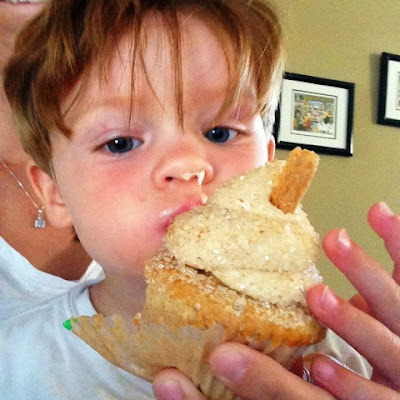 I thought he would just eat a bite or two, but he ate the entire cupcake (his was Churro). That's my boy! The OC Cupcake Classic at the OC Fair is just around the corner. And there is still time to enter the contest! This fun, amateur cupcake competition takes places on Saturday, August 3 at 1:00pm. Registration can be completed all the way until July 31. You can read all requirements here (scroll down to page 21). There are four age groups for this competition: Blue Ribbon Kids (age 5-8), Juinor Youth (age 9-12), Young Adults (13-18), and Adult. For the adults, there are three categories: fruit-flavored, chocolate, and other cupcake creation. Last time I judged the chocolate category and by the time I finished, I never wanted to eat another chocolate cupcake again. I have been fortunate to be a part of this great community event for the past several years, and I can't wait to do it again. I hope to see lots of you there! Can you get more adorable than this?!!! I don't think so. I saw this Richard Austin photo originally posted on Serious Eats' website a few days ago, and I couldn't help but share it. Seriously though, how much cuter can you get? I'll find any excuse to stop by a cupcake shop. I told my husband I wanted to meet him for lunch near his work. But really, I wanted to check out Babycakes in Torrance, CA. 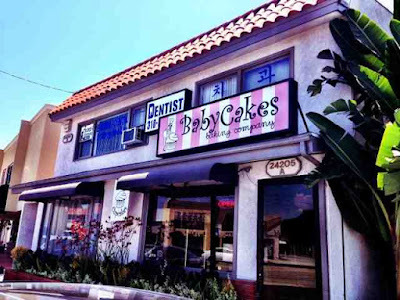 BabyCakes Baking Company is located on Hawthorne Blvd in Torrance, CA. The part I didn't factor in was having my dog with me. I totally didn't even think about not being able to bring her into the store. 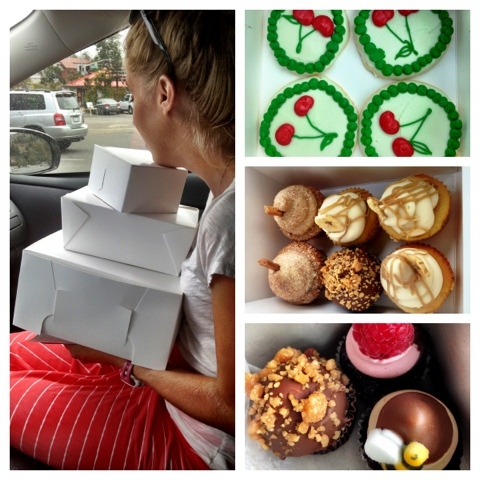 Luckily a nice women helped me out by picking out some cupcakes and bringing them outside to me. I told her to just pick her four favorites. 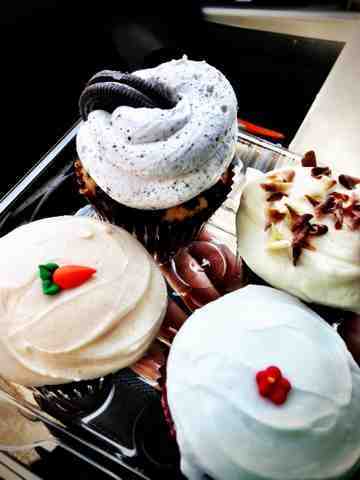 So my random cupcake picks were: Oreo, Carrot, Vanilla, and Red Velvet. I wish I could have seen what other flavors were available that day because I definitely would not have chosen vanilla. Oh well. Oreo: vanilla cake topped with crumbled Oreo pieces and whipped Oreo frosting. I wish this had been a chocolate cupcake because the whipped frosting was just too light for a vanilla cake. Also, the cake was a little dry. Carrot: typical carrot cake with cream cheese frosting. This cupcake was easily my favorite with it's silky cream cheese frosting and moist carrot cake. Noticeably missing were the walnuts, but I usually pick them out anyway, so it was a win for me! Vanilla: can't get more boring than vanilla cake with vanilla buttercream. I did like the presentation of the white chocolate curls on top. The cake was a bit dry, but the frosting had a strong vanilla flavor. There was also a whipped cream center. I usually am all for frosting in the middle, but whipped cream is not my cup of tea. Red Velvet: red velvet cake with cream cheese frosting. I was surprised that the frosting wasn't nearly as good as the cream cheese frosting on the carrot cupcake. The cake had a dark red color, which is always a good sign for red velvet, but it was dry, so that was a disappointment. Overall, I was a bit underwhelmed by the cupcakes at BabyCakes. I had a hint this would be the case because this actually wasn't my first tasting of BabyCakes cupcakes. 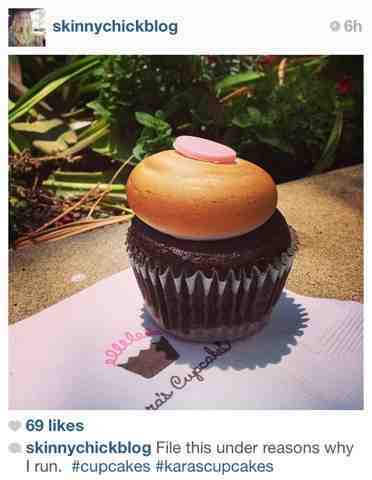 I first discovered them at the LA Cupcake Challenge in 2010. I vividly remember not liking the frosting. They could have changed in three years, but my flavor palate says no. On a brighter note, I would definitely eat the carrot cake every day. Also, I would like to go back to try some other flavors. Signature cupcakes at BabyCakes are $2.95 and specialty cupcakes are $3.50. Can't ever go wrong with butterscotch! Surprisingly, I don't think I've seen a butterscotch cupcake before. This Butterscotch Cupcake Supreme recipe from Sweetapolita is a brown sugar cupcake, brushed with a rum syrup, injected with homemade butterscotch sauce, topped with whipped marscapone frosting, and drizzled with more butterscotch sauce and toffee bits. Doesn't that sound delicious?! You can find the recipe from Sweetapolita here. Yes I love eating desserts, but I have to admit that I'm not the best at baking them. I can usually follow a recipe relatively well, but there are many occasions where I completely mess up. But I keep trying. That's the important part. And when I got a hankering for something sweet last week, I gave my spatula-wielding another try. This recipe from Picky Palate required browning butter. 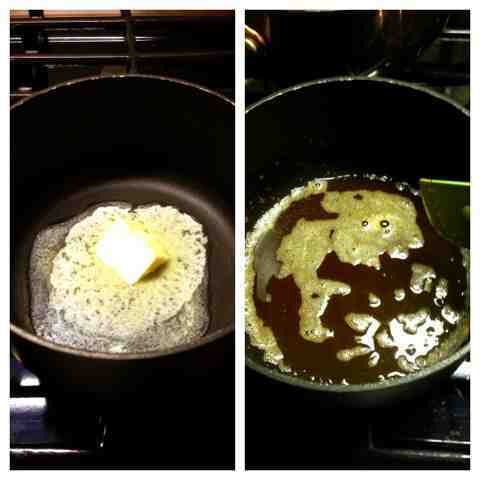 I don't know why I thought this would be hard, but this was my first time browning butter. But what do you know?....it was super easy and totally worth it in the end. The recipe I chose to make was Brown Butter Salted Chocolate Chip Cookie For One. I've made millions of chocolate chip cookies, but this one was different. Why? It's all about the brown butter. 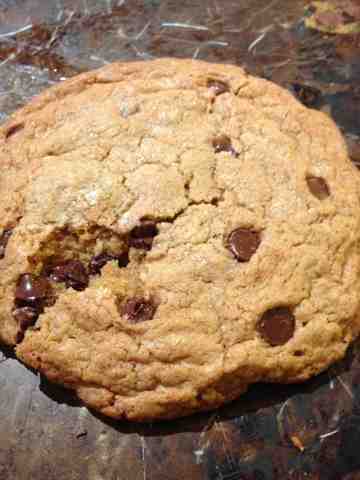 The recipe makes only one cookie, but it's a big one. And I ate it all myself! I couldn't even wait to take a photo before taking a bite (see the crack down the middle?). How often do you get to eat award-winning cupcakes? 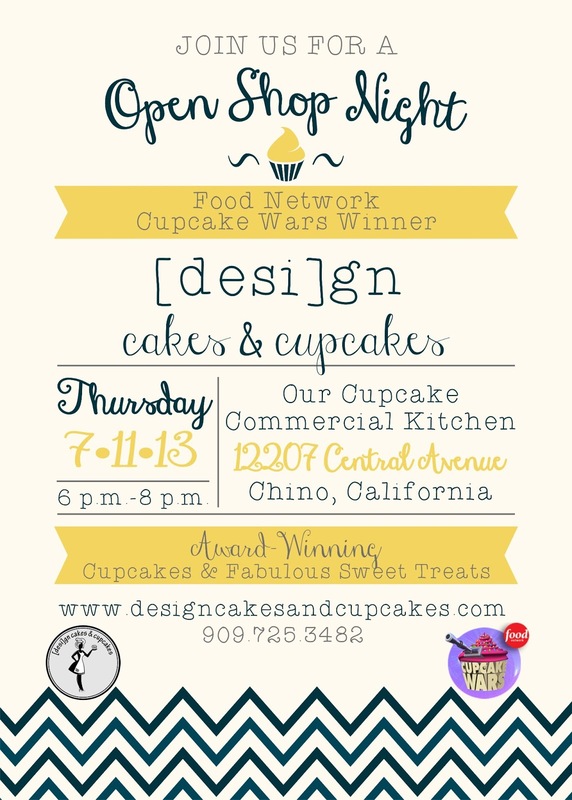 Every so often [desi]gn cakes & cupcakes hosts Open Shop Nights at their commercial kitchen, where you can stop by to eat and buy cupcakes. This Thursday they will be hosting another one of their fabulous events. If you happen to be near the Chino, CA area on Thursday night, you should definitely swing by. I used to work in Chino, so this would have been perfect for me, but now I don't get out there as often. You can find all of the info you need on the flyer above. 4th of July is my favorite holiday. What's not to like about this super-fun day? BBQ's, watermelon, water balloon fights, swimming, fireworks...it has everything! 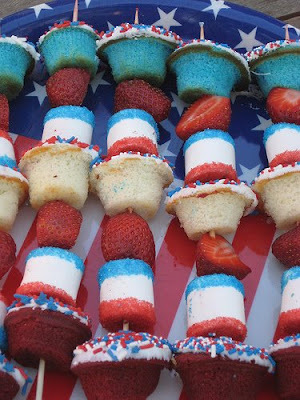 I had to re-post these 4th of July cupcake kebobs from Meringue Bake Shop because they are such a great idea! If you want to make them too, you can find the tutorial HERE. I'm glad I'm not alone in the cupcake-running world. 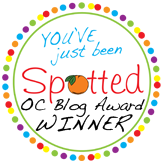 Thanks Skinny Chick Blog!